When family ties are tested by military service, the Blue Star Mothers of North Carolina boost spirits and offer support to those overseas and close to home. Feature image, above: The Blue Star Mothers of North Carolina Southern Piedmont, Chapter Four: (back row from left) Martha-Maria Crespo, Jeanette Brummer, Faye Smith, Melanie Russell, Kimberly Ammons, (front row from left) Carol Sandke, and Rosalia Cairelli. Melanie and the residents of this retirement home in Charlotte have a common bond. Many of the men served in the military. And many of the women are mothers who remember hanging starred service flags in their windows, projecting pride and soliciting prayers: one blue star for each child serving. Like Melanie, who organized the day’s activity, those mothers tried to stay busy, too, helping other soldiers and families, even after their own children had returned home. One of the care packages they’re filling today is headed to Romania, to a Marine who’ll be celebrating his birthday during his deployment. Melanie doesn’t know his age, or anything else about him except for his favorite candy. She found his name on a list compiled by “Operation Birthday Hug,” which dispatches moms to deliver packages and good wishes to active-duty members whose own families are far away. Melanie doesn’t mention that the other young man they’re mailing a package to is her son Jonathan Russell, who is turning 22 on an Air Force base in Colorado. She tries to keep her thoughts on the task at hand. “What did you do in the Army?” she asks another man at the table. He lifts his eyes slowly, then his arms. Silently, he draws back one arm and squeezes a remembered trigger. Melanie is still for a moment. The realities of military service are never far from her mind. She knows that boys have been growing up to be men and men have been going to war since before there were countries to fight for. But for their mothers, the historical precedent does not translate into familiarity. For each child who announces his or her intention to join the service, there is a mother who has just inherited a new identity that is as foreign to her as a stranger’s pair of shoes. When Melanie became a military mom, she had questions, things to learn: What to wear for a basic military training graduation? How to send a care package that won’t break as it travels halfway around the world? How to deal with the constant, swirling mix of pride and anxiety? How to be a parent from thousands of miles away? 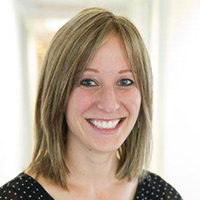 She quickly discovered — as every new mom does — that the best answers come from other mothers. The tiny, white faux-brick building where the Blue Star Mothers of North Carolina Southern Piedmont, Chapter Four, meets on the third Saturday of each month is only as large as a few parking spots. 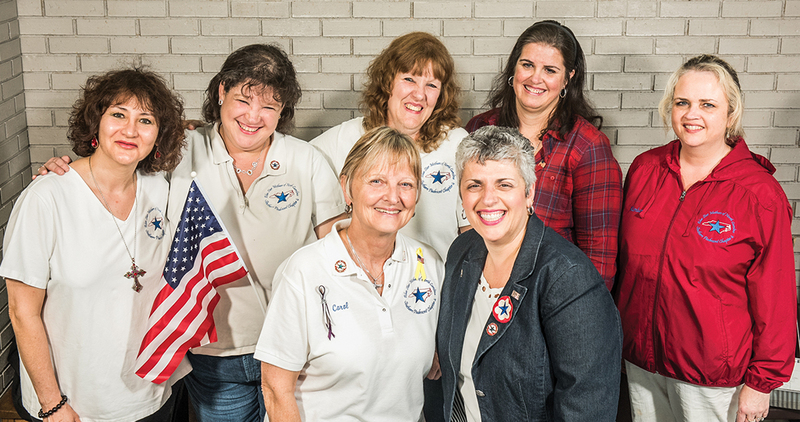 The modest space in Mooresville reflects the group’s very small budget, but these women don’t need much room to carry out their mission: to support one another; share hopes, fears, and advice; and serve the local veteran community. Founded in 1942, the Blue Star Mothers of America is nonpartisan, nonsectarian, and apolitical. It has more than 200 chapters in 40 states, and members pledge to dedicate themselves “to the perpetuation of democratic government.” Despite North Carolina’s abundance of military personnel — the state boasts the third-largest military population in the country, with about 134,000 active-duty, reserve, and guard members and more than 800,000 veterans — there are only three Blue Star Mothers chapters here. The groups must fund-raise to remain active, and some have folded. With fewer Americans feeling the direct impact of war, membership has waned. For each child who joins the service, there is a mother who has just inherited a new identity that is as foreign to her as a stranger’s pair of shoes. But for Melanie and the handful of other mothers in the group, America’s battles play out close to home. Her older son, Joshua, had visited the recruiter first. He wanted to feel proud when he answered the question: “What do you do?” Melanie remembers that his mind was already made up after that first meeting. Jonathan, four years younger than his brother, had planned to go to culinary school after he graduated from West Stanly High. But the Russell boys were inseparable. So by the time Josh swore to support and defend the Constitution of the United States, Jonny was only a few weeks away from raising his right hand, too. Besides sending care packages, the mothers in the chapter pitch in at all sorts of events: They help hand out hot dogs at a veterans’ motorcycle ride and decorate a truck for the Troutman Independence Day parade. 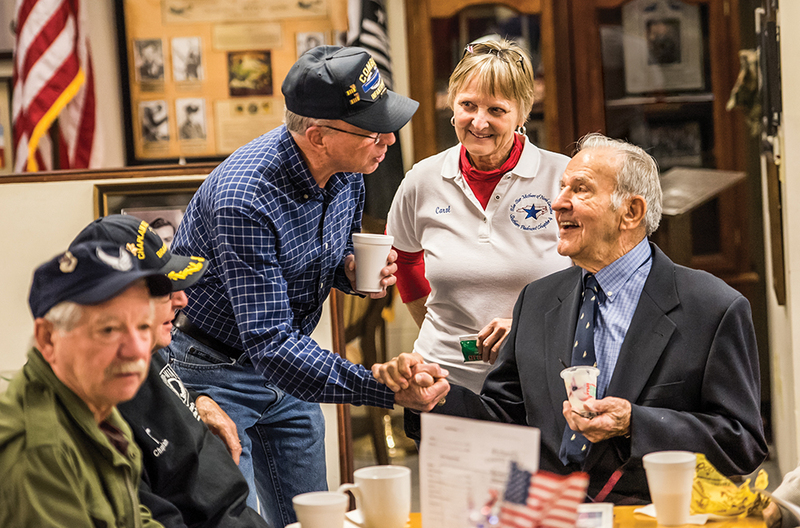 Before every major holiday, they bring biscuit sandwiches, fruit, and juice to the aging veterans who gather at Richard’s Coffee Shop on Main Street. The café doubles as a living military museum, filled with photos and artifacts collected over the years by its owner, a former gunship pilot. Here, they all feel part of the larger military family that spans generations. “It’s important to try to find somebody that you can talk to,” says Penny Sigmon, a chapter member whose son served for five years in the Marine Corps. While he was on active duty, he missed all five Thanksgivings, all of his birthdays, all of her birthdays. Penny didn’t bother putting up a tree when he was deployed over Christmas. She had fears and questions, and turned to groups like Semper Fi Sisters and the Blue Star Mothers for support. “You have somebody that can answer those questions for you or just give you a shoulder to cry on — who understands,” she says. On a cool, foggy Saturday morning in Mooresville, the Blue Star moms pull folding chairs around a borrowed table as Rosalia Cairelli, the group’s treasurer, hands out a list of the past year’s events for review. With most of their children now veterans, the need for hugs and prayers has lessened over the years. These moms usually jump right into planning the next breakfast or yard sale. But this morning a newcomer shows up and says she has four kids on active duty. She doesn’t know where they are — or doesn’t want to say, still sussing out this new group of potential ears and shoulders. Slowly, the group lapses into the conversations it was created to have: about how strange it is not to know where your children are, or what they’re doing, or if they’re safe. Then, a member shares some news of her own: Her son will be deployed. He’s excited, she says. Two years stateside has felt like a lifetime to him when he’d rather be out there. She’s nervous, of course. She’s seen the way other boys have returned home, changed. No one makes false promises. Instead, they offer a fierce solidarity that is more comforting. Two weeks before Josh left Stanfield for basic military training, Melanie threw the boys a surprise “see-ya-later” party that celebrated all the holidays they’d miss over the next year. Eighty friends and family members ran from tent to tent, lighting sparklers for the Fourth of July, putting on costumes for Halloween, sitting on Santa’s lap and telling him what they wanted for Christmas, then counting down to New Year’s. There was a raucous game of “finger football” for Super Bowl Sunday and rounds of the family Olympics they played on their annual trip to the beach. The day before Josh left home, he gave his mom a long chain with links made of paper. On the inside of each curl of paper, he’d written something to make her feel better. “It’s just a vacation,” one read. “Only 1 percent of Americans choose to serve. Be proud. You raised two,” read another. Every night, the last thing Melanie did before going to sleep was read one of the links and tear it off the chain so that it would get shorter and shorter. She found that the bond she had with her boys did not diminish with distance. When Jonny was stationed at Lackland Air Force Base, he told her they served grilled cheese sandwiches after church every Sunday, so Melanie and Jonny’s then-fiancée got together in Stanfield every Sunday to eat grilled cheeses, too.